San Francisco: Hyundai's new two-door Accent looks good, considering its cheap price. It starts at under $11,000 for a basic, stripped-down model, and it’s around $14,000 for one with more goodies. Build quality in the affordable Accent is much better than in the Hyundai's cars of just a few years ago. And if you're looking to save money on your car payment, and your gas bill, this is a great way to do it. One of the most annoying aspects of the automotive industry is its incessant need to make cars more "upscale," no matter how humble their background. Take Volkswagen. This company spent decades building a reputation for cheap, efficient, well-engineered cars. That was fine, until one day someone at Volkswagen woke up, with a mental disorder, that made him decide to produce a $100,000, V12-powered luxury car called the Phaeton. It was a wonderful car, one of the best luxury cars the world has ever seen, but it still came with a VW symbol on the hood, so it sold like snowshoes in Hawaii. Just 820 Phaetons were sold in 2005, making it a bigger flop than the Edsel was. Korean brands are trying to do the same thing. Instead of building their reputation for high-quality economy cars, as the Japanese did in the 1970s, the Koreans are trying to move their cars upmarket, so they can fetch a better price. That's why I love how Hyundai, a company that's bending over backward trying to convince the world that it can produce high-quality, luxurious vehicles, but still makes a perfectly good, low priced car. The 2007 Accent doesn't have gobs of power. It doesn't have a giant cargo area that can hold several sheets of plywood. It doesn't have squishy seats. It doesn't have soft leather. It doesn't have an air-conditioned glove box for keeping your drunks cool. And really, it doesn't need all that stuff. The Accent is a very basic car, with a very basic mission, to save you money. It costs just $10,415 in its cheapest form and gets a very thrifty 37 miles per gallon on the highway. My test car, the two-door Accent SE, wasn't quite as stripped down with a $13,915 base price. But even at that affordable price level it came with air conditioning, power everything, keyless entry, a decent stereo and a leather-wrapped steering wheel. OK, so they couldn't completely avoid that "upscale" temptation. The Hyundai Accent drives about how you'd expect from an economy car, and perhaps a little bit better. It feels like it has the same suspension as a skateboard and the same engine as a Lionel train, but it's not bad for commuting and the basic trips around town. In fact, it was good enough to make me wonder why so many people buy huge cars and SUVs when, for 99 percent of the trips we make, a super-efficient car like the Accent will do perfectly fine. The Accent also looks like it benefits from Hyundai's decision to make nicer, fancier cars. The build quality isn't bad, certainly far better than the Hyundai cars of just a few years ago, and I never once felt deprived of anything while behind the wheel. Whether you want an affordable new car with a great warranty, or something to save money at the gas pump, the Accent is worth a closer look. Just pray Hyundai doesn't decide to make an Accent "Prada Edition" next year. INFOBOX: What was tested? 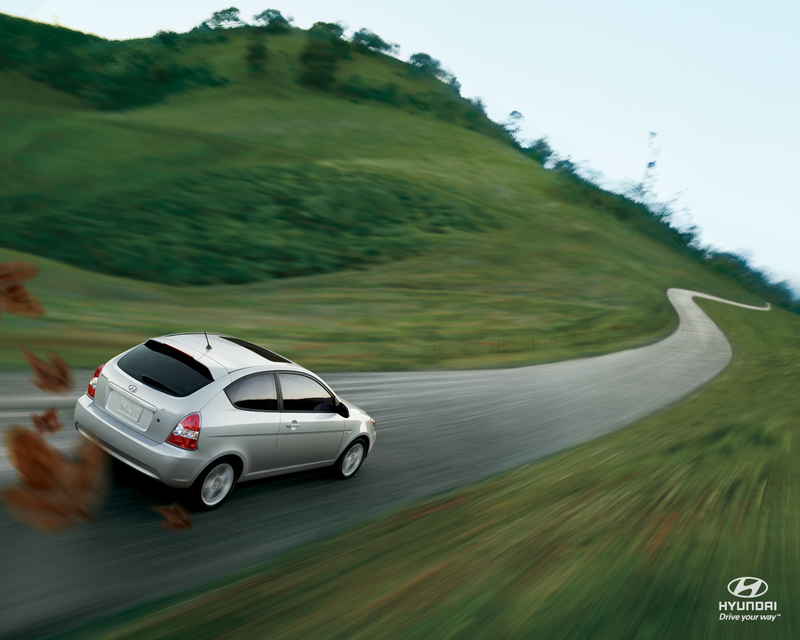 The 2007 Hyundai Accent SE 3-Door with a base price of $13,915. Options: Sun & sound package ($1,250), sporty floor mats ($85). The price as tested with a MSRP of only $15,250. Why avoid it? A good used car might drive better and be more comfortable. Why buy it? It's basic, super efficient transportation at a great price. And it comes with a complete new-car warranty for the price of a decent used car.